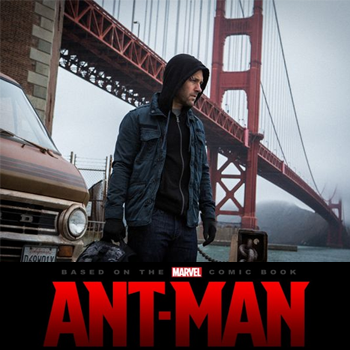 While it looks like we'll have to wait awhile to see what the first "new" Marvel hero set to debut after Avengers: Age of Ultron looks like in costume, the studio has released the first official shot of what Paul Rudd's Scott Lang will look like in his civilian identity as a burglar operating in San Francisco. The film only yesterday resumed filming under new director Peyton Reed, with original cast members Rudd, Michael Douglas (as "original" Ant-Man Hank Pym), Corey Stoll and Evangeline Lily joined by new players including Judy Greer, hip-hop star T.I., Michael Pena, Bobby Cannavale, Wood Harris and John Slattery. Interestingly, it is being presumed that Slattery will be reprising his role as the older Howard Stark (Iron Man's dad) from Iron Man 2. If so, it's plausible he may be seen in flashbacks as an associate of Pym, as the elder Stark is supposed to be dead in the present of the Marvel Cinematic Universe. First appearing as scientist who discovers how to radically alter his physical size in an Outer Limits-style story by Stan Lee and Jack Kirby in 1962's Tales to Astonish #27, Dr. Pym was upgraded to the costumed superhero Ant-Man (who retains full-sized strength even when shrunk to the size of an insect) a year later and became a founding member of The Avengers. In the film, a now-older Pym will draft the younger Lang (Rudd) to become a new Ant-Man in order to stop the villain Yellow Jacket (Stoll) from using the technology for evil. The film was originally being directed by Edgar Wright, who departed the project three months ago over creative differences.